Labyrinth of Lies has been selected to represent Germany in the Best Foreign Language Film category at next year's Academy Awards. It was directed by Giulio Ricciarelli and tells the story of the legal and social struggle Germany faced approximately a decade after WWII and the fall of the Third Reich. On learning a former Nazi is teaching children in a Berlin school, an inexperience public prosecutor named Johann Radmann (Alexander Fehling) initiates a larger purge of more notorious closeted Nazis. The idealistic Radmann soon runs into “brick walls” going forward with his cause. Former Nazis abound in the current government --- under Chancellor Konrad Adenauer --- and cover for each other. Radmann is frustrated. Fritz Bauer (Gert Voss), the prosecutor-general, charges Radmann to lead a investigation of former workers at the Auschwitz extermination camp. That takes Radmann onto bigger fish with names such as Josef Mengele and Adolf Eichmann. A Lies subplot puts Radmann next to a seductive young woman called Marlene (Friederike Becht). In a rather unsurprising twist, Radmann's team is so thorough, it's finally revealed that not only was Marlene's father a Nazi, but so too was Radmann's: much dissension between the two lovers. 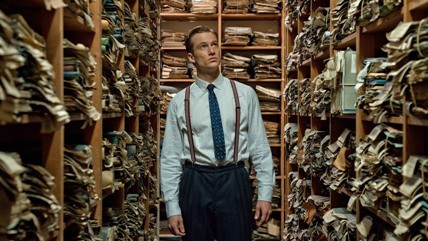 Labyrinth of Lies comes very much out of German culture. Ricciarelli's movie is perfunctorially brisk, crisp, efficient, somber and terribly generational. It's as if younger German citizens in the Fifties had never absorbed the affectations that come with such history of a politics gone mad only two decades before. The script, by Elisabeth Bartel and Ricciarelli in collaboration Amelie Syberberg, has an awkward feel to it. Too much time is spent on the early, low level machinations of the Radmann team's investigation, and little is given with regard to the evasive Mengele, who was never apprehended. Eichmann's distant capture in Argentina by Mossad and subsequent trial and hanging in Israel all come after the time line that encompasses the film. Ultimately, Ricciarelli seems to be turning the question on how anyone seeing his film might behave in such a circumstance as the ordinary German citizen did just before WWII ... and later as German Fascism was rampant. Maybe Ricciarello wants to assuage lingering guilt of the defeatred German people and that the victorius understand they might well have taken such a path that, today, they'd easily consider to be unthinkable. Lies can't measure up to the memorable German production that won the Best Foreign Language Oscar: The Lives Of Others (2007), directed by Florian Henckel von Donnersmarck. Still, Labyrinth of Lies is an excellent movie to see .... and then, ask yourself that question. Copyright © 2015 by Gary Chew. All right reserved.